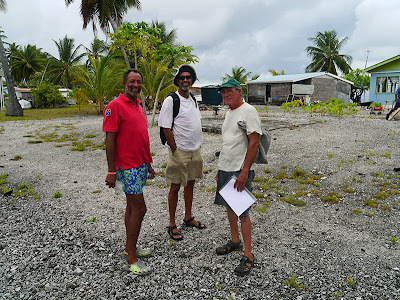 Tetautua village on Penrhyn atoll (Tongareva) is not the first village we’ve visited in our travels that has been small enough to meet every inhabitant, but it’s the first one we’ve stayed at long enough to do just that. 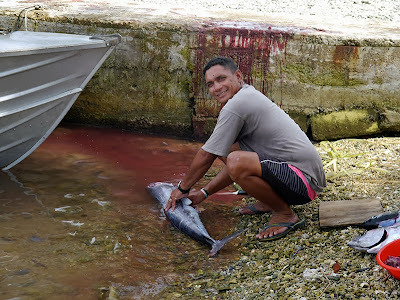 While many of the villages in the Vava’u group’s outer islands (Tonga) were small, we visited multiple anchorages in Vava’u, only staying three to five days in each one. 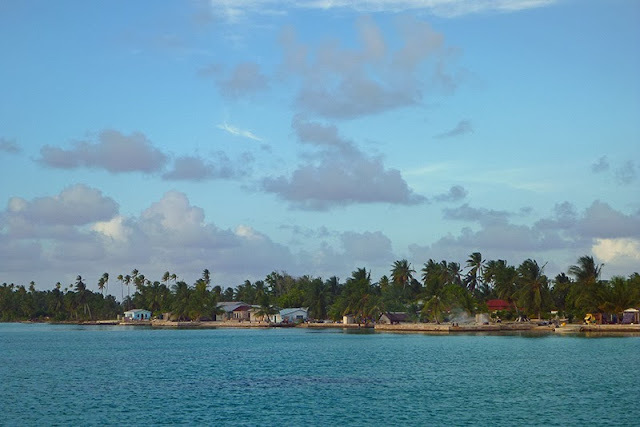 Arriving at Penrhyn atoll with over six weeks until the official end of the Central Pacific hurricane season---the finale of which would make it safer for us to depart for Hawaii---we settled in for a month’s stay in Tongareva. Although we also visited Omoka village three times during that month, most of our stay was spent off the village of Tetautua, due to its superior anchorage. We learned that when you spend almost a month in a small village as special as Tetautua, it is very hard to leave. Note: Some of the names in this post may be spelled incorrectly. I was unable to verify the spelling of each person's name before posting; however, I have spelled them phonetically to the best of my ability. We learned that in Cook Islands Maori, "r" and "l" are interchangeable, similar to the way in which "b" and "p" are interchangeable in some other island dialects. For example, the word "rito"may also be pronounced as "lito." The lagoon adjacent to Tetautua is clear, with a sand bottom that is only dotted with large coral heads (instead of being virtually covered with them like in Omoka.) A well placed anchor allows plenty of room to swing without worrying about wrapping your chain around a bommie. 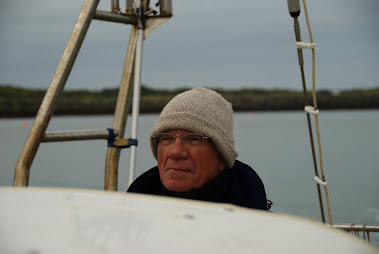 The prevailing winds blow from the other side of the motu the village is located on, and there is little fetch to the wind and waves in the anchorage. We were one of a record six boats in the anchorage (at one time) during our stay. 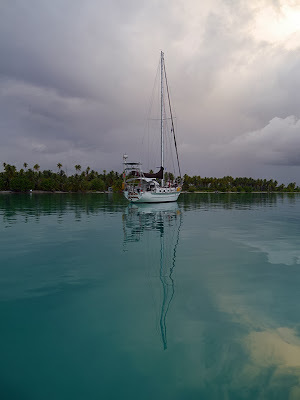 While the lagoon, the pass, and several false passes are teeming with sea life, the visibility in Penrhyn atoll was never that clear. 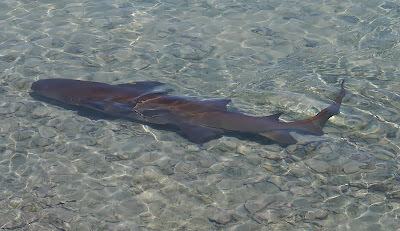 We saw a barracuda over a meter long in Tetautua pass, and SV Saliander saw manta rays in both Tetautua and Taruiia passes. There were hundreds of colorful fish on the patch reefs within the lagoon, and we saw some gigantic porcupine fish in the passes. There were also many small sea turtles within the lagoon. 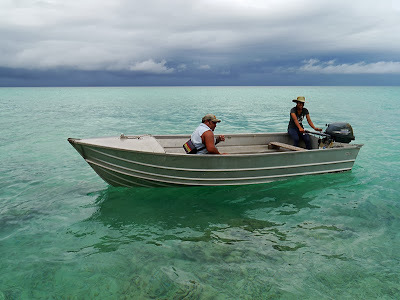 There is no ciguatera in Penryhn, so we fished in both the lagoon and in the pass. Between what we caught, what the villagers gave us, and what fisherman extraordinaire Pete on Saliander shared with us, we ate more different kinds of tropical fish in Penrhyn than we have ever eaten: emperor, barracuda, milkfish, blackjack (black trevally), redfish, yellowfin tuna, bluefin trevally, and parrotfish. If you are lucky, you can arrange a fishing trip with the villagers outside the pass, but we didn't have the opportunity to go on one. 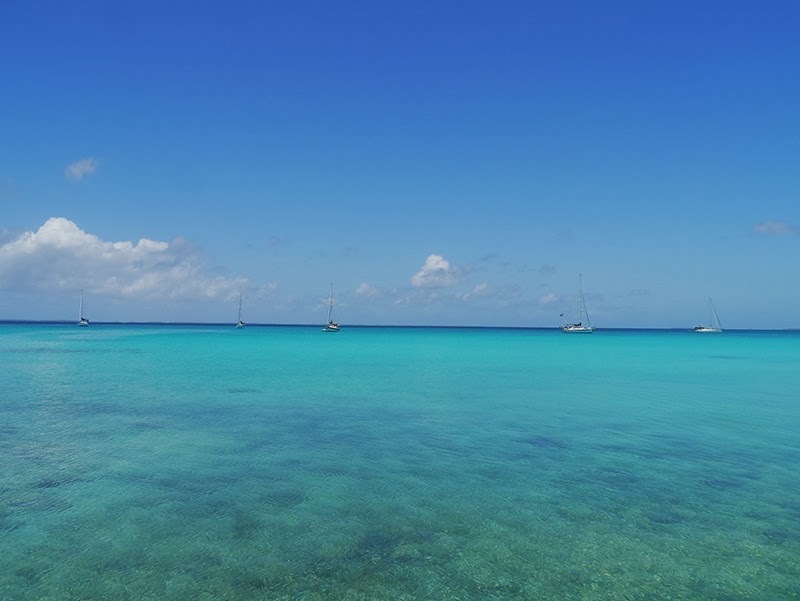 The crews from Silhouette and Saliander also went lobstering on the reef on two occasions: once, with two of the villagers and once on our own. 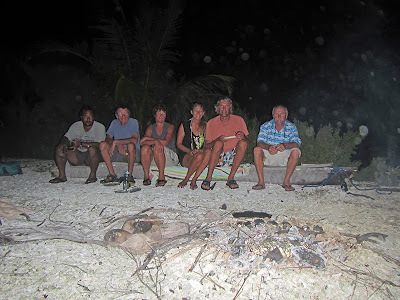 Pete was the only one (other than the locals) to catch any lobster, but we enjoyed these night walks on the reef. 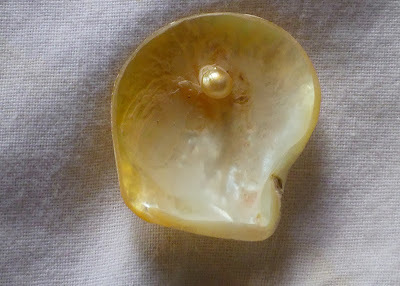 We saw an astounding variety of fish and invertebrates, including cowries. 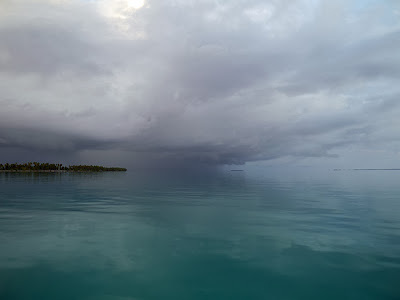 We also saw our very first lionfish, a fish that manages to look both delicate and dangerous at the same time.These typical atoll diversions were enjoyable, but they were not the main attraction. 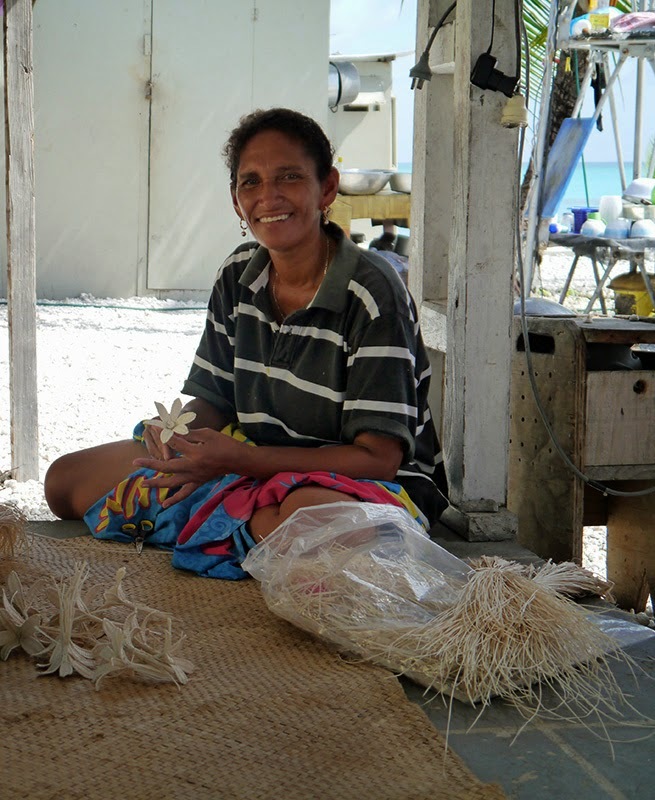 The villagers and their way of life were the most interesting thing about Penrhyn atoll. 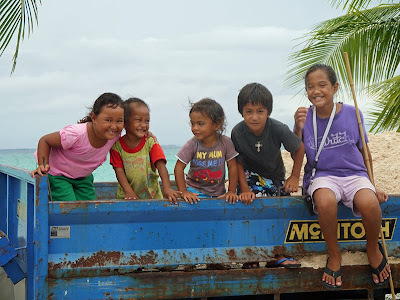 Our first day ashore in Tetautua was a Sunday, so we attended church services. We were joined by the crew from Saliander and one crew member from Cariba (the other crew member was ill.) Although the singing throughout the South Pacific is legend---and we had already attended one church service in Omoka---I wasn’t prepared for the stunning beauty of the Cook Islanders’ song in Tetautua. The men and women sang separate parts, and both men and women sang harmonies within those parts. A song of praise truly sounded like a song of praise, with loud voices winging their way to the vaulted ceiling of the church, seemingly strong enough to lift it right off. You felt as if your heart was going to burst, so joyous was their noise. Hymns, in contrast, were quiet as lullabies, leaving you feeling soothed and peaceful. Different church elders, deacons, or members of the Sunday school began each song and seemed to know exactly when to start singing without any sort of cue. Likewise, as we continued to attend church on successive weeks, we noticed that different members of the congregation assisted the minister (or acting minister) with parts of the service. The responsibilities for the church service were shared by all. To accommodate their “English speaking friends,” at least one Bible reading was always given in English if yachties were present; the others were in the villagers’ native tongue of Cook Island Maori. No photos are allowed inside the church, so I have no photos of the interior of either the Omoka or Tetautua churches.They were lovely, with vaulted wood ceilings and stained glass windows in basic geometric patterns rather than Bible scenes. The church in Tetautua was more decorative with wood-brocaded diamonds and hearts framing parts of the ceiling. The changing times were reflected in the church chandeliers, which held a mixture of both incandescent and compact fluorescent bulbs. After church, the yachties had all been invited to lunch at the minister’s house. 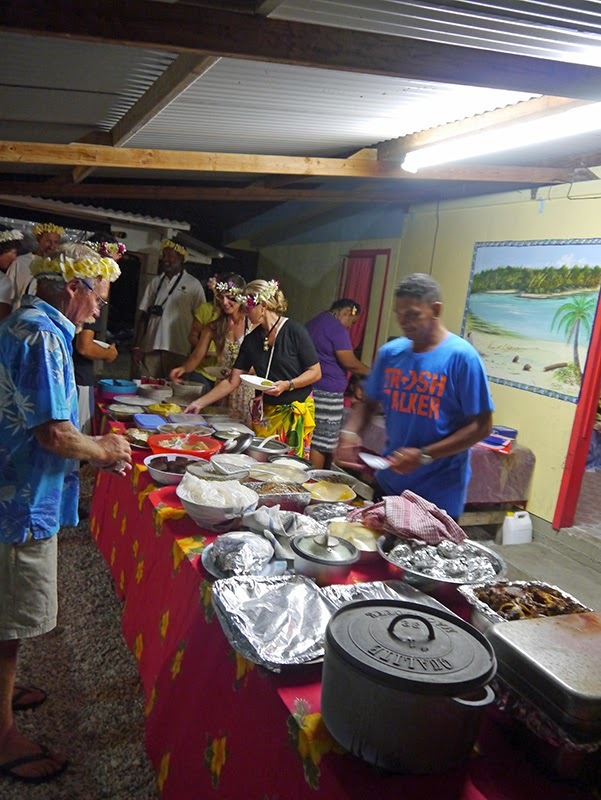 We enjoyed a meal of local foods and conversation with the minister’s family before returning to the boat. On Sundays, no work is allowed on Penrhyn. Sunday truly is observed as a day of prayer and rest. Villagers attend three church services on Sundays (along with morning services two other days each week.) The use of motor driven vehicles is not allowed on Sunday, except to get to church and back. This includes boats and dinghies. 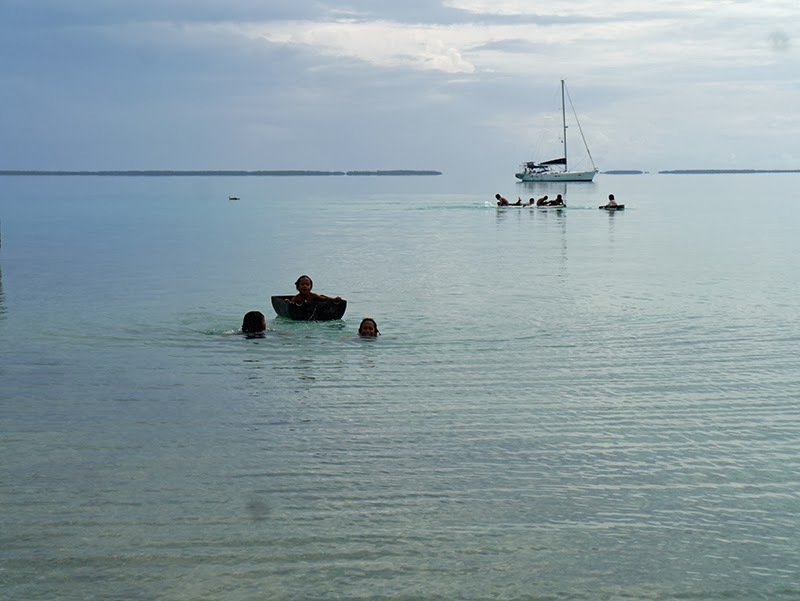 Out of respect for the Tongarevan culture, no one moved their yacht on Sunday (whether to change anchorages or to leave the atoll), and none of us used our dinghies after returning from church. This meant long, sweltering Sundays spent in confinement on the boat (there is also no swimming allowed on Sundays), unless we wanted to return to the village for the evening church service. In the evening, with the 7 p.m. bell, the sabbath was officially over and the prohibitions ended. 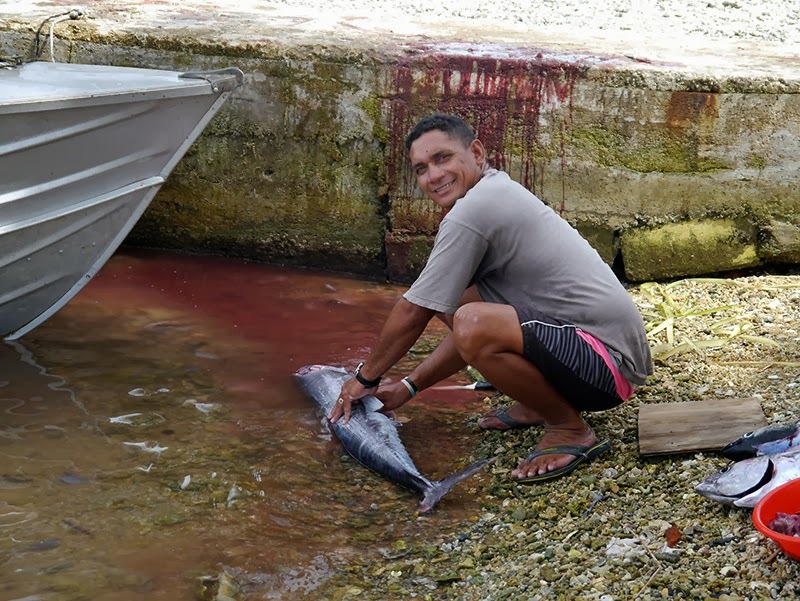 Some villagers left in their aluminum launches to go fishing on Sunday evenings. The church bell rang every evening at 7 p.m., and the bell called the villagers to prayer three days a week. The sound of the bell was part of the rhythm of the village, and we became fond of the sound. The next day we set about exploring the village and meeting many more of the villagers. One of the things most noticeable about Cook Islanders, and Penrhyn islanders in particular, is their hospitality. As we wandered around the village, we were often called over for a chat or offered a cup of tea. 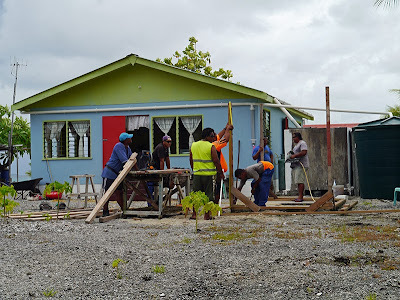 Sometimes, we were invited into peoples’ homes, but often, meetings took place in an outdoor work area that almost all villagers had adjacent to their homes. Much of the work of the village took place outdoors because it was simply cooler there. In the weeks to come, we spent many hours visiting the villagers. The people of Tetautua welcomed us into their homes and their lives, allowing us an intimate glimpse into the life of the village. After we got our bearings, the villagers put us to work. Most of the male yachties were asked to help with specific tasks, and they kept Patrick and the other men busy fixing outboards, sewing machines, battery chargers, and motor bikes. 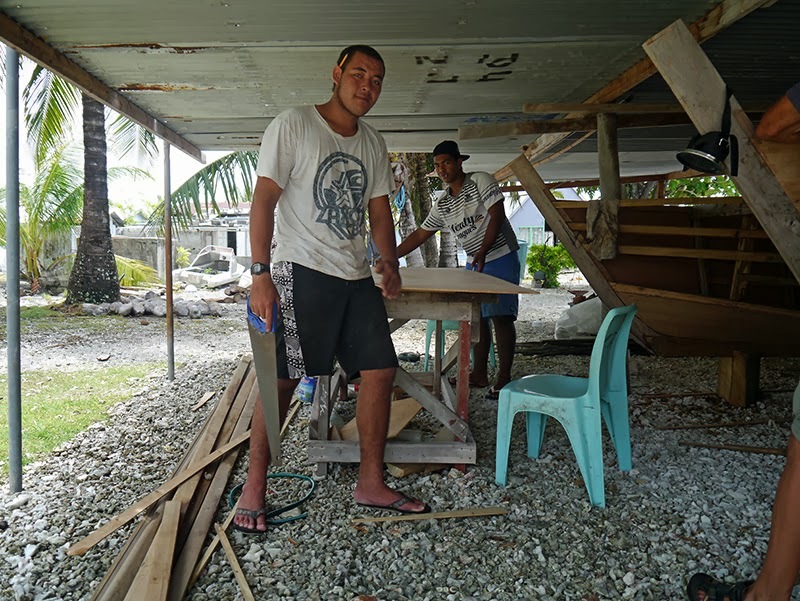 Al and Phil, who had finally moved across the lagoon, helped to tear down and put up a ceiling; while Pete repaired a chain saw. Female yachties participated in whatever work the women of the village were engaged in at the time. 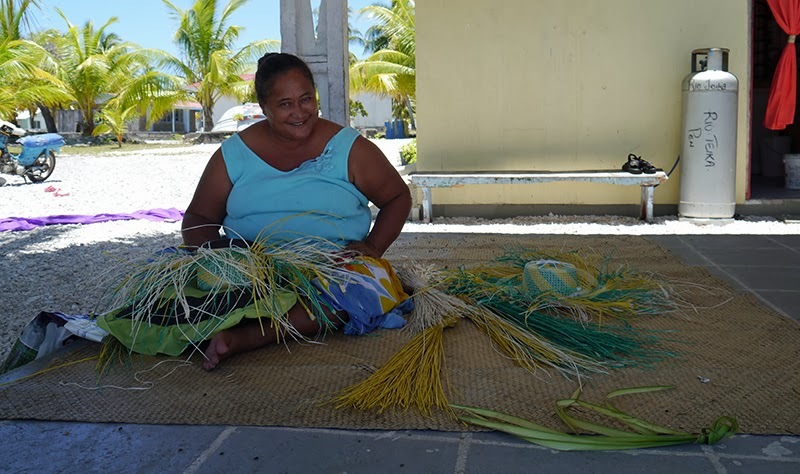 While visiting the village women, it was natural to lend a hand with preparing the palm frond material (called “rito”) used for weaving or with dying fabric for curtains. 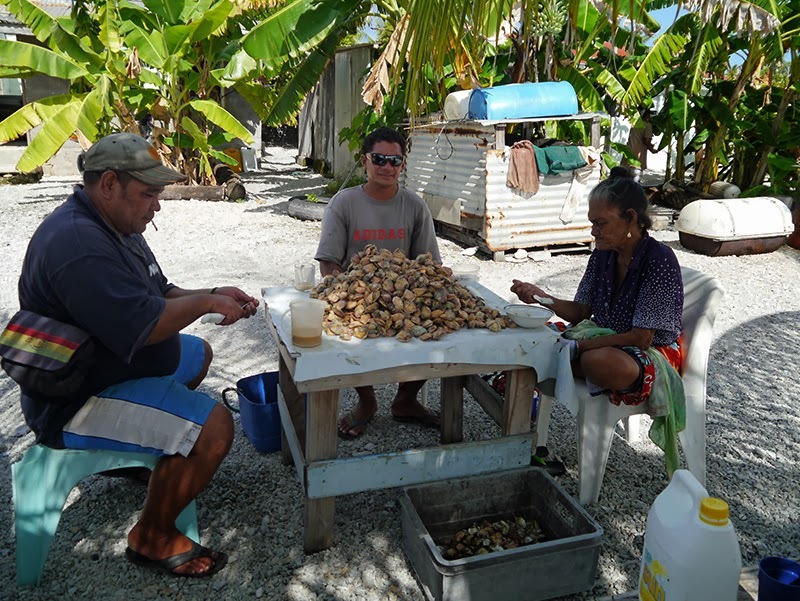 I also helped both village men and women open oysters (“pipi”) in the late afternoons (after the divers had come back from the pipi) to look for the natural golden pearls found inside. 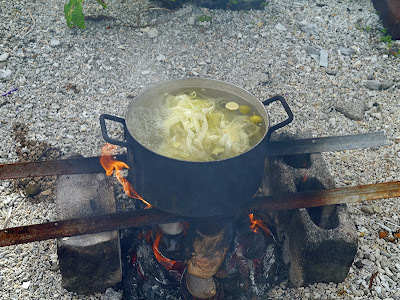 In return for our assistance, the villagers brought us fresh fish, gave us bananas or a papaya, or prepared us a meal. 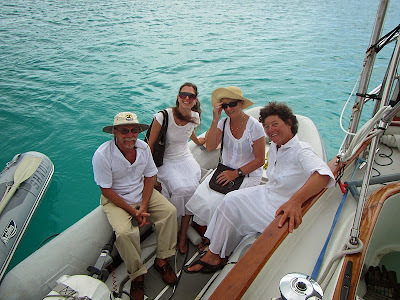 On Penrhyn, we had more of the experience that cruisers in the past might have had. We really appreciated receiving that fresh food. The Cook Islands have included some of the most remote areas we have traveled to, and we have been out of fresh produce for over a month and fresh meats for almost two months. Other than the few fish we caught ourselves, or some generously shared by Pete on Saliander, this was all the fresh (or frozen, for that matter) food that was available. After about a week of helping intensively at Tetautua, when the first of the six yachts was preparing to leave the atoll and move on, the villagers invited us to a community dinner intended to thank us for our help. 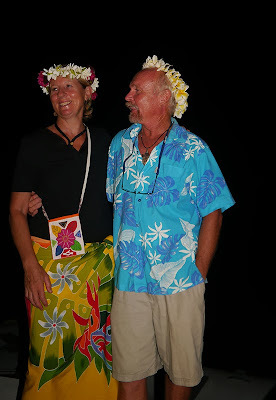 On the appointed evening, we all dressed up and came ashore, bearing potluck dishes for the feast. 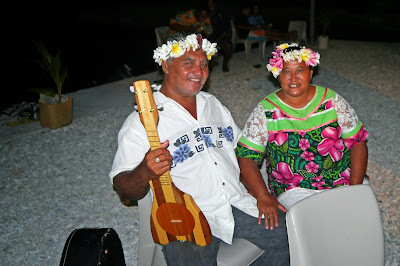 We were crowned with fragrant flower crowns of frangipani and tiare maori made by Aloha and Mama P. Before dinner and while we were filling our plates, some of the village men entertained us by playing ukuleles and guitars. When it was time to eat, the yachties were served first and seated at a long table. However, we did not have to eat in front of an audience like in Omoka. Once we were served, the villagers helped themselves and sat around eating with us. 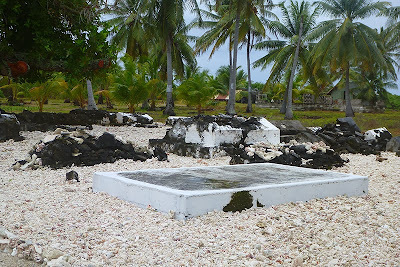 After dinner, I helped the women wash the dishes, which they did seated on the coral rubble using large bowls as sinks. They had an interesting water conservation system of using two wash bowls (a first wash with very dirty water to remove the heavy food waste, then a second wash in cleaner water) and a rinse bowl to wash the dishes. The dishes were then laid out on the coral to dry. The final event of the evening was the premiere showing of a video that one of the yachties, Isabelle, had been working on with the school children. 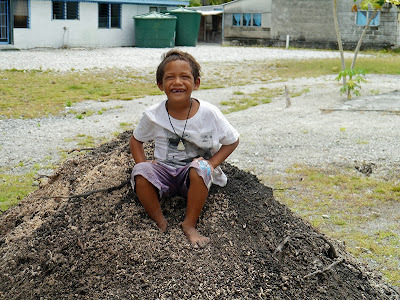 Each of the primary school children was responsible for reporting on a segment of village life, including a tour of the village; fishing; weaving; using coconuts; gathering wild bird eggs; and pipi, and the results were not only informative, but hilarious. 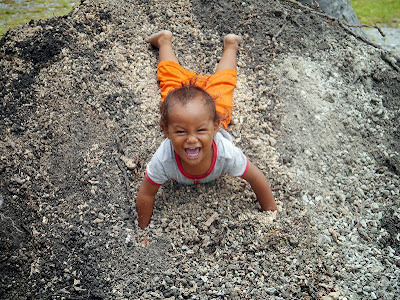 Not only ourselves, but the villagers were in stitches, as they clearly enjoyed the “kids’ eye view” of village life. It was a wonderful, memorable evening, and a good time was had by all. All too soon, it was time for some of the yachts to be moving on. Just Drifting and Cariba floated through the pass. 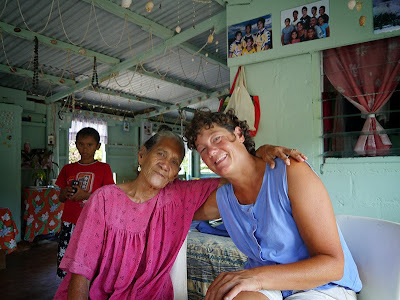 We spent another week and a half in Tetautua, learning more about the village. Tetautua has the good fortune of being located near a very productive fishing ground at Flying Venus Reef. 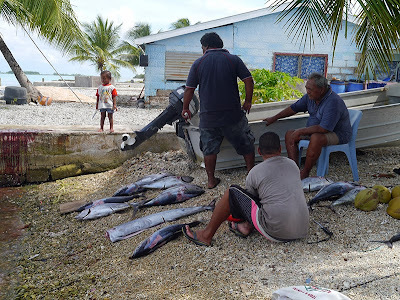 Fishing for wahoo, tuna, and blackjack outside the pass was one activity in which only men seemed to participate; but women helped to salt and dry tuna after it was caught. One of the village activities I will miss most dearly is that of the children swimming and splashing in the lagoon. 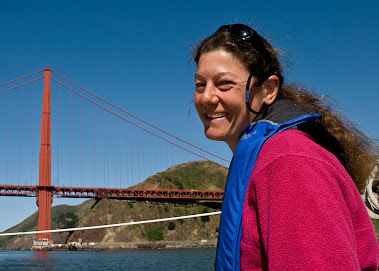 The older kids use halves of fifty-gallon drums and an old paddleboard as flotation devices, while the toddlers simply splash in the shallow water in boat haul-outs next to the wharf. The children often swam while black tip and nurse sharks were in the vicinity. Nurse sharks are reportedly "gentle giants"
Another village activity going on at the time of our visit was the building of the lagoon's first catamaran. While historically, the villagers used to fish out of open wooden boats, these have by and large been replaced with aluminum launches powered by outboards. However, the cost of petrol/gasoline for a simple trip across the lagoon (which some villagers make on a weekly basis) can be high. 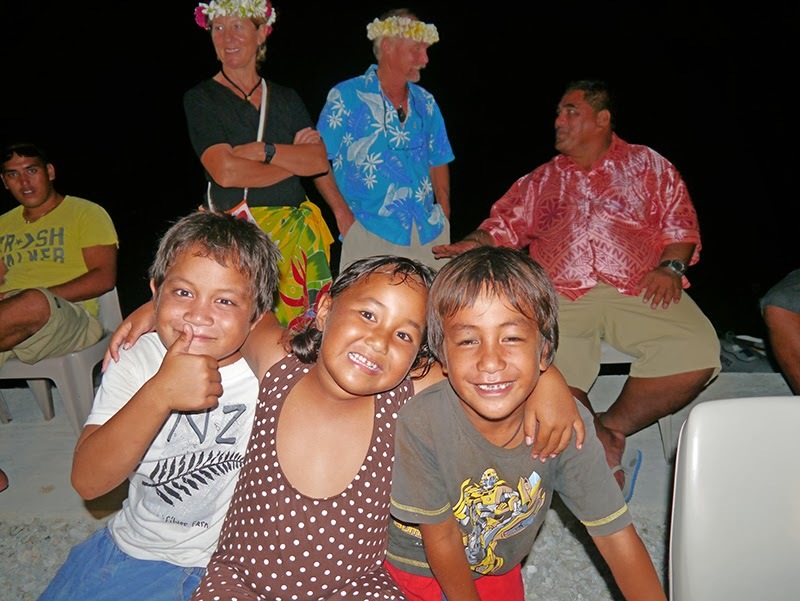 Papa Rongo, his grandson Small, and the minister's son Tai Tai were building a sail-powered vessel by hand. Only women did the weaving, but both men and women helped prepare the rito, clean “honiu” (another type of palm frond material) for brooms, and polish shells to be used in hats and jewelery. 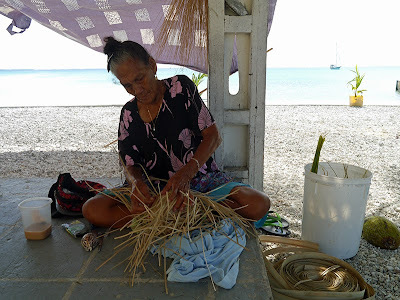 Preparing the rito for weaving is a time-consuming and labor intensive process. First, young palm fronds are cut from trees (entailing climbing the tree with a big knife in hand.) 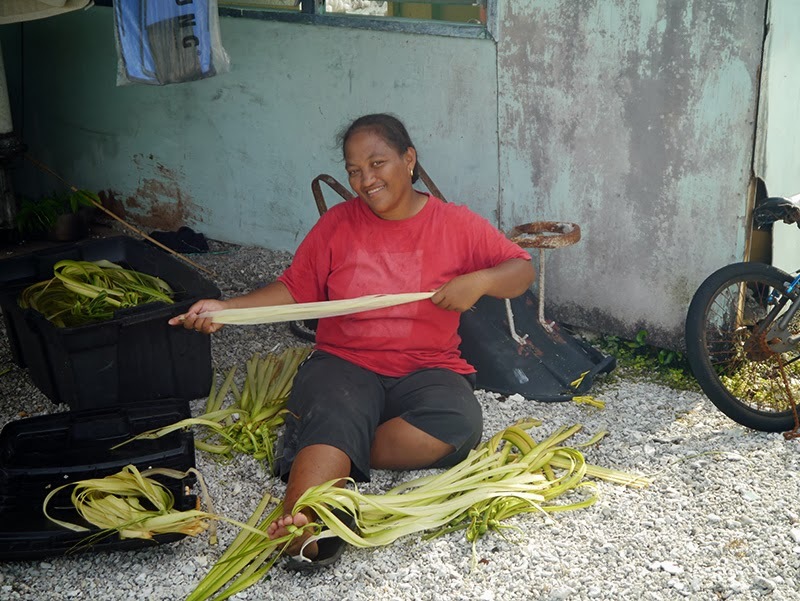 The palm fronds are separated into two parts: The tender green leaves are stripped from the fronds and tied into bundles to be made into rito, leaving a coarser, tougher edge that will be made into material for brooms (honiu). The green leaves are then scored horizontally across one end using a needle, so that a thin, almost-transparent layer can be lifted off. 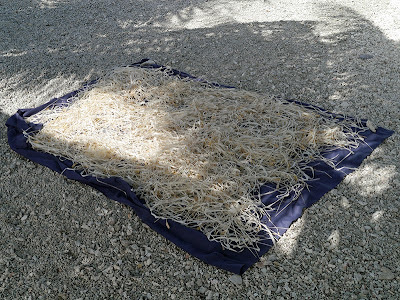 This looks much easier than it really is (I tried it), and the sound of expert weavers stripping off a layer of rito is like the sound of tearing fabric. After the thin layers are stripped off and again, tied into bundles, they are boiled for whitening (and, I assume, to kill pests.) Next, the bundles of rito are hung and dried. Finally, some of the rito is dyed using natural root dyes. 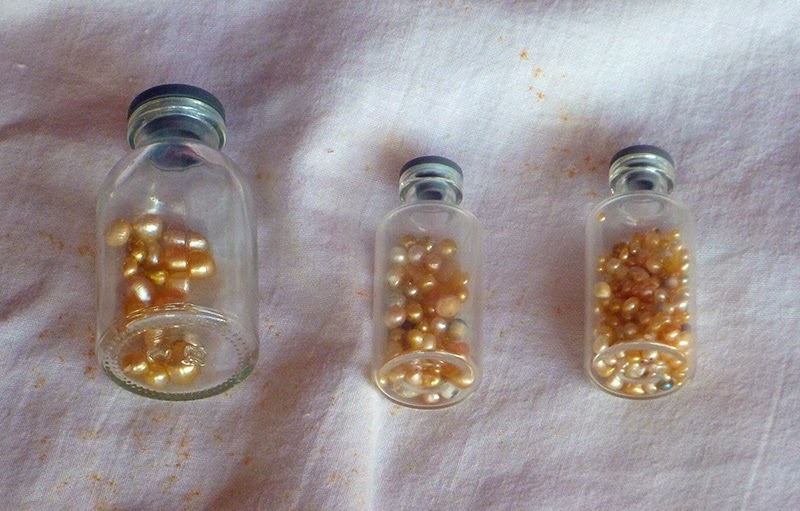 In the present day, store-bought dyes are also used to create colors not available in the plant dyes. After the dyed rito is dried a second time, it is almost ready for use...but not quite. Each strand of rito first has to be smoothed first, using the dull side of a paring knife. 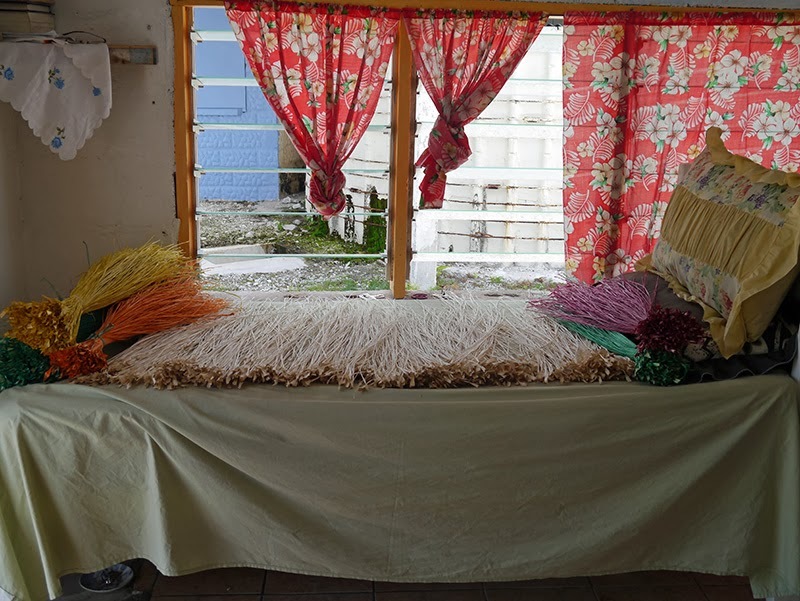 At minimum, the entire process of simply preparing the rito for weaving takes three days; but if dyed, it can take up to five. An experienced weaver can make a hat in a single day, if she works on it from dawn until dusk. Since most of the women have other domestic chores they are responsible for, it typically takes them two or three days to finish a hat. The hats are built around a hat mold (usually a piece of native wood.) These days, many of the hats contain a polished black pearl shell in the crown of the hat. They look very elegant, but the village elders (the "mamas") complain that the shell is a crutch because the younger women don't know how to start the hats properly. If the shell breaks, they explain, there goes your hat! 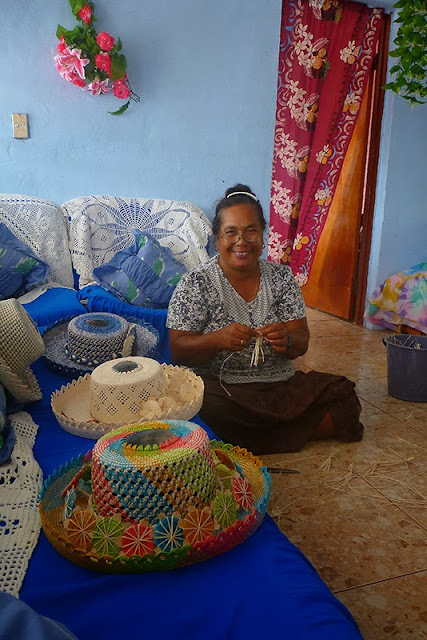 The most experienced weavers in the village can make a hat with a durable solid crown, woven out of rito. Tongarevans are very religious, and a lot of their customs and traditions center around the CICC (Cook Islands Christian Church.) One such tradition is “White Sunday,” which occurs on the first Sunday of each month. After its moniker, on White Sunday, the entire congregation dresses entirely in white clothing. (Khaki or cream pants are acceptable for men, although many do wear white pants.) The women, of course, wear white hats to accompany their white attire. This Sunday, we learned, is the communion Sunday for the church. (They do not have communion at every mass like the Catholics.) On a coral atoll in the South Pacific, we discovered that “the body of Christ” is symbolized with coconut meat; while “the blood of Christ” is coconut water. The Monday following "White Sunday" is set aside as a community work day. 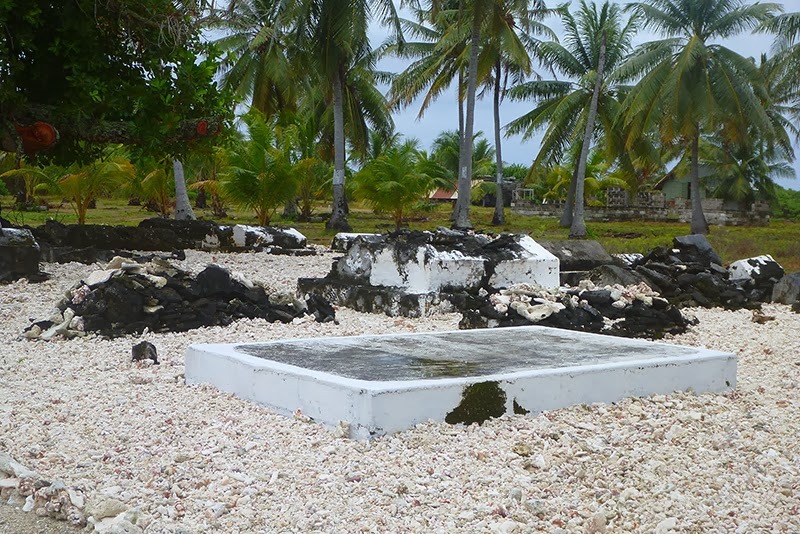 While we were there, the villagers were busy cleaning up the graveyards on the island. 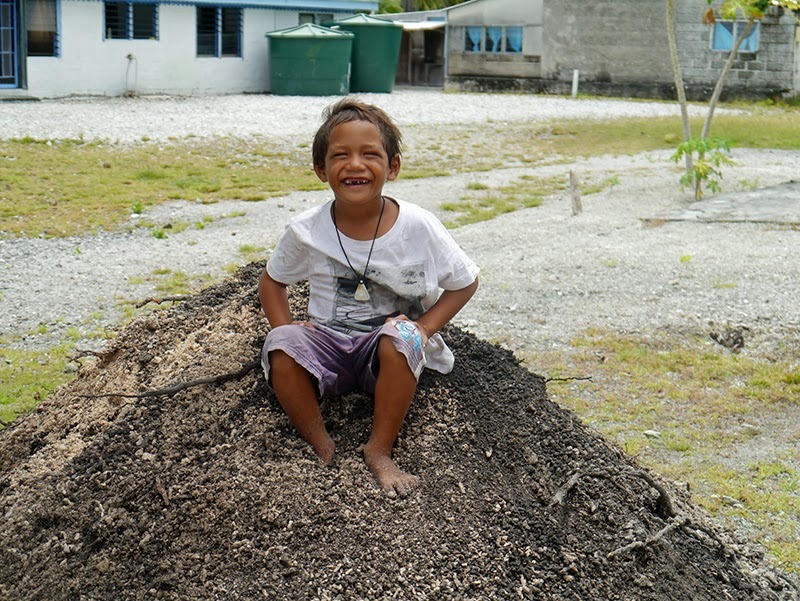 As on many South Pacific islands we have visited, people are buried on family land, and multiple small cemeteries exist in the form of family plots. Coconut husks and palm fronds that had fallen over the graves were gathered up and burned; weeds were pulled; and a layer of sun bleached white coral was spread around the ancient graves. I assisted with spreading the coral around one of the cemeteries. Another set of Tongarevan customs and traditions, also involving elaborate attire, revolves around the Christmas holidays. 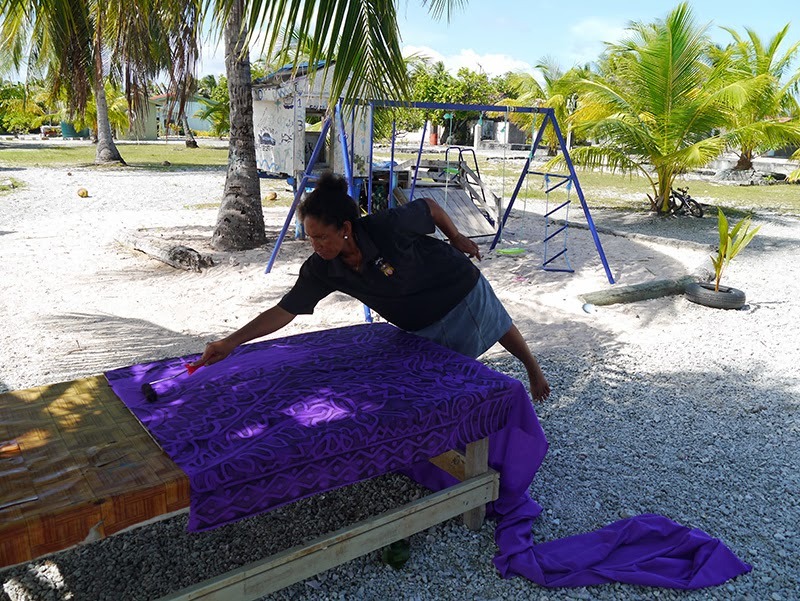 We happened to arrive at the atoll during a very busy time for both villages: the beginning of their preparation for the holiday season. Yes, Christmas begins in Tongareva in October, and you will soon understand why. First of all, the villagers were expecting a large delegation of former islanders now living in Australia. 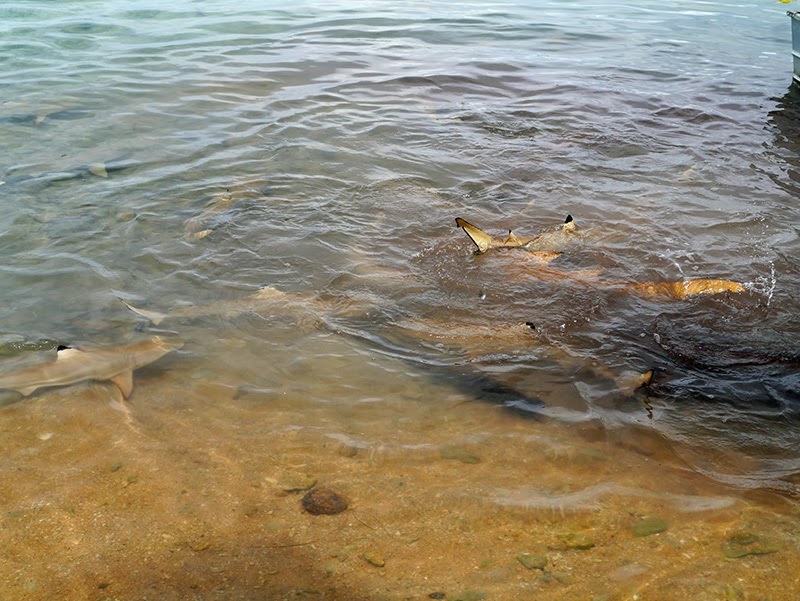 These Penrhyn natives return home for a visit every holiday season. 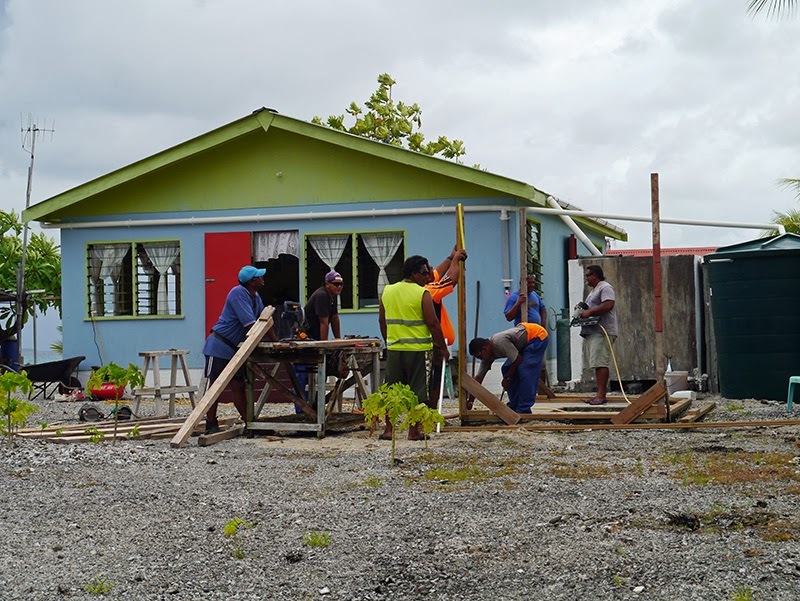 Since many of them own homes in the village---which they allow other families to stay in during their absence---a period of house renovation precedes the owner’s return. Additionally, hats and brooms are woven as gifts for the returning kin. Second, the entire holiday season is a big deal in Penrhyn---not only because of the visitors from Australia---and it involves many festive customs. 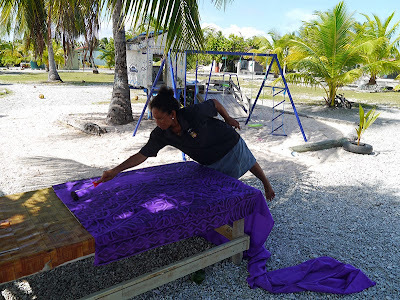 All the houses in the village change the color of their curtains one week before Christmas (some also change the color of their house paint), so this tradition entails the making of new curtains, starting in October. 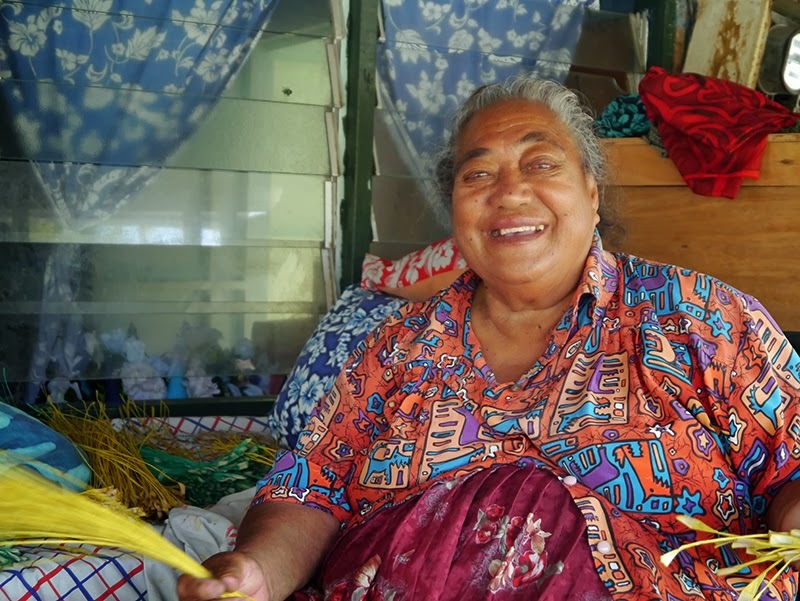 Atoll homes have a multitude of doors and windows for ventilation; thus, there are many more curtains than one might imagine. Some of the curtains are dyed in a clever way. A large board is routed with the intended pattern for the curtain. Then, the fabric is pinned to the board and textile ink applied with a paint roller: It’s sort of like making a reverse block print. Another Penrhyn holiday tradition is that all of the village women wear identical hats on three specific dates during the holidays: Christmas, New Year’s Day, and the closing of the holiday season about one week after New Year’s. 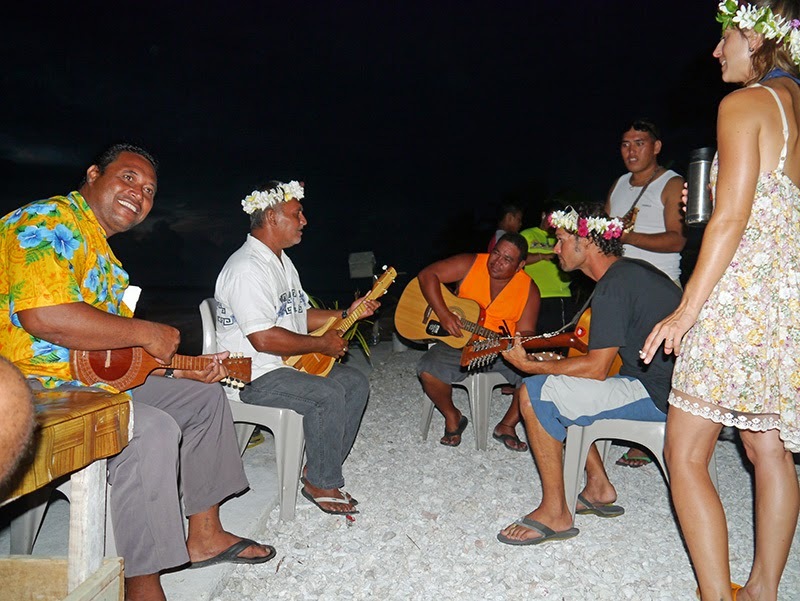 On these days, as well as on Christmas Eve and New Year’s Eve, holiday celebrations are held which include (in addition to the usual church services), singing and dancing competitions between the villages of Omoka and Tetautua and holiday feasts. When I say the village women wear identical hats to these events, I don’t mean that they wear the same hat on all three occasions. I mean that they design a different hat for each of the three important dates. One woman is responsible for creating the design for each of the special days, and all of the village women follow that design when weaving their new hats. And when I say “hats,” I mean that the women weave identical hats for each female member of the family. Depending on how many daughters a woman has, this could mean weaving three or four hats for just one of the three dates. Added to this daunting task is the creation of new dresses (for the women) and shirts (for the men) from fabric matching the hats. Again, the garments are identical for the entire village for each of the important dates and are created in multiples matching the number of people in a household. If this weren’t enough work (and enough spectacle!) for the holiday season, we also learned that each family creates hat/clothing designs for both Christmas Eve and New Year’s Eve. 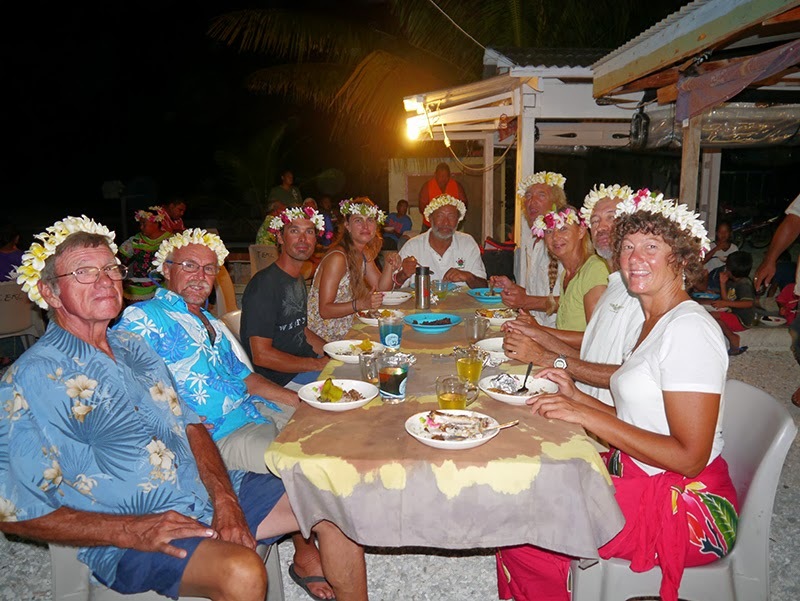 Holiday activities are held on these evenings during which individual families dress identically (their hats and fabric usually matching the color of their new curtains), but the entire village does not dress identically. So, if we add all this up, the holiday season entails the creation of five outfits for each member of the family and five hats for each of the female members. Depending on the size of the family, this could mean weaving up to twenty different hats for the holiday season alone! Now you know why the women of Penrhyn begin their preparations for the holidays so early! What a sight Tetautua village must be, all decked out for Christmas, with new curtains on every house and everyone dressed in matching clothing and hats! I wished we could stay through the holidays. Few yachties witness these events because the Christmas holidays occur during the cyclone season, when most prudent yachts have left the area. The villagers very fondly told us of one yachting family that had stayed in Tetautua for over a year. 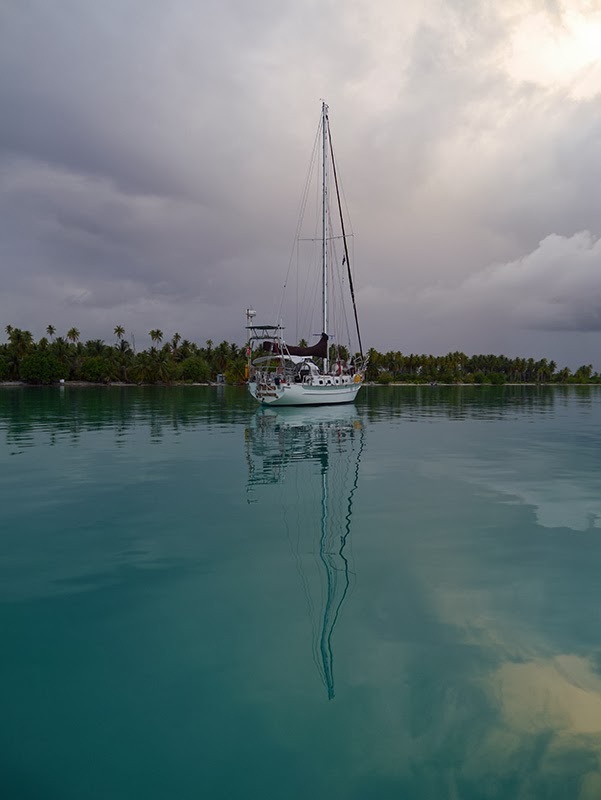 Their yacht had been dismasted, and it took that long to find and ship (via cargo ship) a new mast to remote Penrhyn atoll. They may have been one of the only yachting families in recent history to witness the spectacle of Penrhyn atoll during the holiday season. We reluctantly had to leave after a month's stay at Penrhyn. 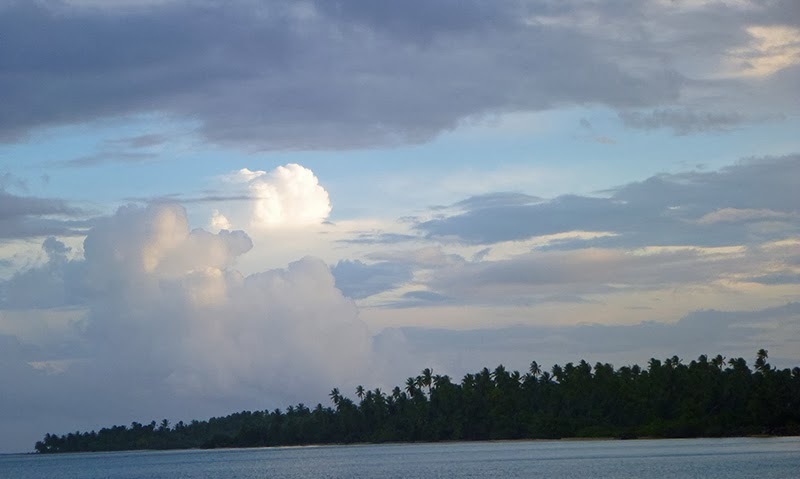 Cyclone season was coming and it was time to move on. It was very difficult and emotionally draining to say our goodbyes to Penhryn. I didn’t realize---until I was confronted with having to do it---the difficulty I would have saying goodbye to the children of Penrhyn. 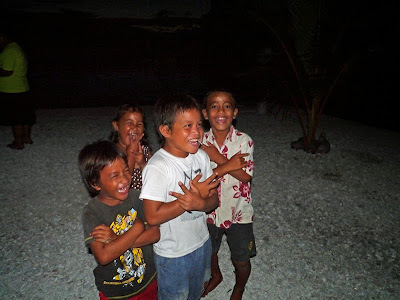 They are some of the sweetest, most innocent children we’ve met anywhere. I turned into a blubbery mess and did not realize how hard it would be to say goodbye until I actually did so. I think I worried some of the children, who had never seen me in a distressed state before. I wish that I had been able to say goodbye with a big smile on my face, but I could not control my tears. 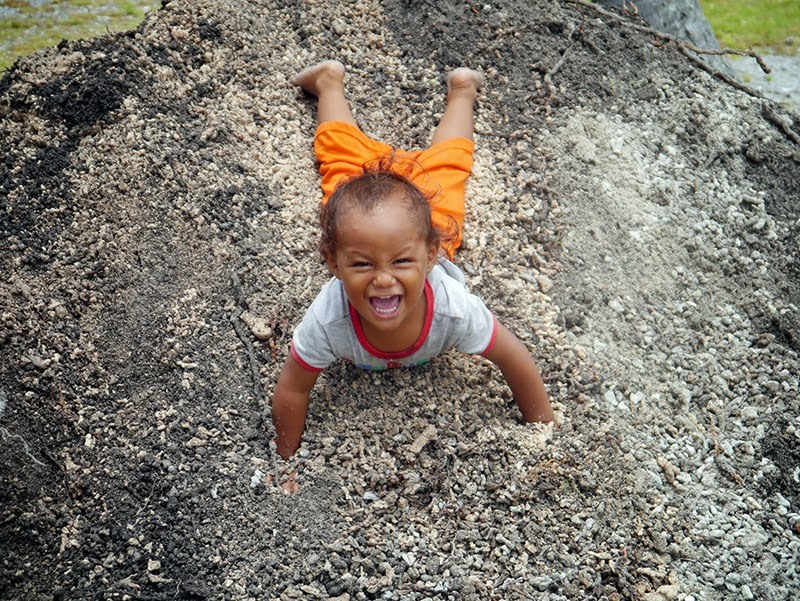 It was so easy to love the children of Tetautua. I will really miss them and the entire village. Of all the places we've been in our travels, Tongareva (Penrhyn) is the one place I would like to revisit in five or ten years to see how the people are getting on. 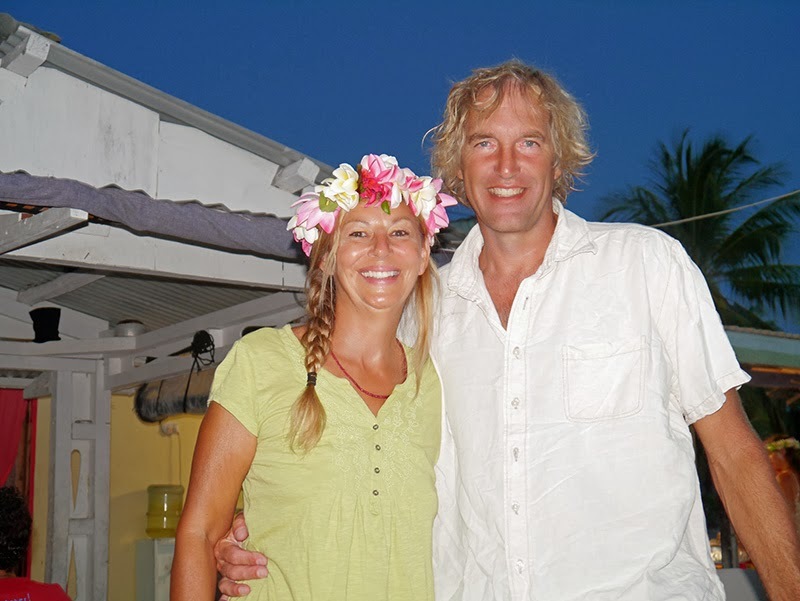 Thank you for sharing your lovely photos and your experieces to the island. Thanks your your comment! We hope you also saw the post about Omoka Village titled "An Island called Penrhyn." Hello my gramps was a US Army doctor who was one of 12, yes 12, Army personal On Penhyrn during WWII. 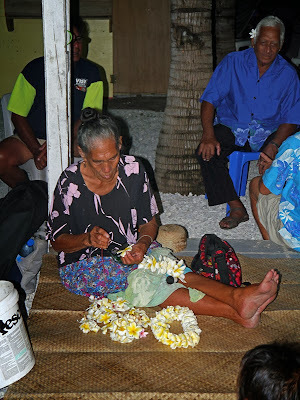 I am wondering if the elders in Omaka mentioned anything about an American Doctor from all those years ago. The WWII photos of my gramps are similar in content to your modern ones, Ie things still done the same way. Thanks for your interesting comment and piece of Penrhyn history. The villagers did mention the Army personnel stationed on Penrhyn during WWII, but didn't mention the "American Doctor" or your grandfather, specifically. Sorry we can't provide more information. It's nice to hear that things haven't changed much, but with the introduction of smart phones and tablets to the atoll (which happened just before our visit), we think change will probably accelerate on Penrhyn. if I could figure out how to post pictures ,it would be interesting to compare my grandfathers from WWII and your modern ones!